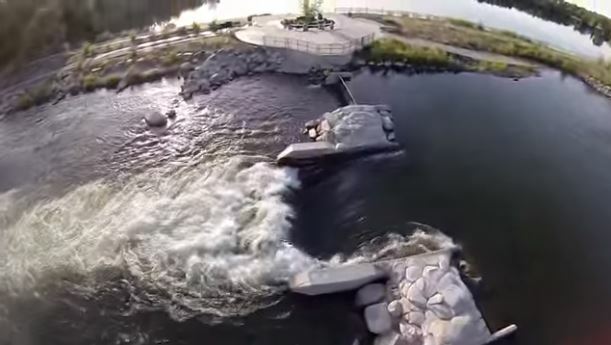 Boise’s River Park is one of the top artificial river surfing waves in the country. It was one of the first fully adjustable river waves in the U.S., and it provides a steep, fast, green wave on “Green Wave” days, and more of a wave/hole on “Wave/Hole” days. Usually the park follows an alternating schedule, but both days can still get you on your board. The wave is fast, tall, and green, and supports small ocean-style boards and big maneuvers. A couple of nearby shops sell boards designed specifically for the Boise wave. With big eddys on both sides and no hazards downstream, it’s a safe wave to surf, though it can certainly be busy. Because the main wave is in a sub channel of the full river, it has a long season with surfable flows. Because the Boise River is divided into separate channels, the current flows for the Boise River have less to do with the shape of the wave than the current settings for the wave shaper. You can check here for the current webcam. And check here for updates on the current schedule. Though the green wave is better for surfing than the Wave/Hole settings, both will get you surfing. Generally, things are sufable from March through October, and look for flows over 800. The park is between 34th and 36th streets in downtown Boise. The main entrance is in front of Idaho River Sports, the O.G. Boise surf shop.